Et Verbum: Simple instructions On The Holy Eucharist As A Sacrament And Sacrifice by The Very Rev. Geo. Edw. Canon Howe. Part 18. Simple instructions On The Holy Eucharist As A Sacrament And Sacrifice by The Very Rev. Geo. Edw. Canon Howe. Part 18. Quite apart from the Fall of our first parents, which involved the moral and physical world in so much evil, there are three chief duties which man owes to God, the creature to his Creator. 1. The first of these is Adoration, by which he acknowledges God to be his Lord and Master, the Creator who gave him his being, and without whose sustaining power he would fall back into his original nothingness. By adoration, man admits all this, recognises his duty, and offers to God the highest worship he is capable of. 2. Thanksgiving is likewise a duty we owe to God, in return for all the graces and favours of every kind that He has showered down in such profusion on each of us, from our earliest existence. 4. Satisfaction. — The Divine Majesty is offended by every sin, even the slightest, that men commit. When, therefore, sin first entered the world, the duty of making reparation followed as a consequence, just as the shadow follows the substance. 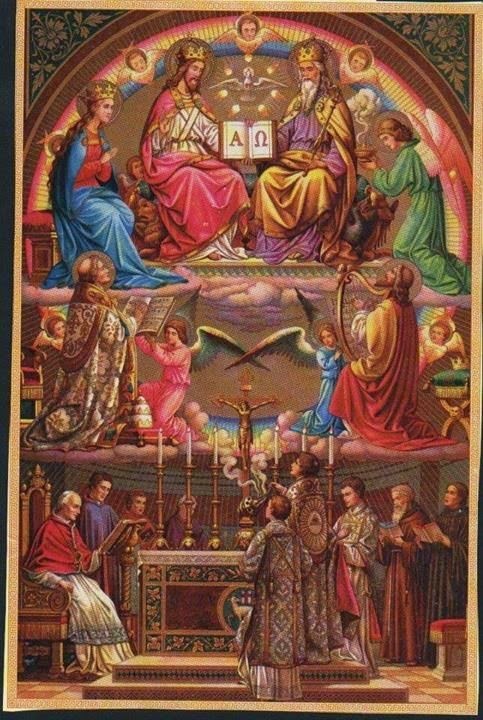 Here, then, is a four-fold duty that man owes to God, and the Sacrifice of the Mass offered, always and everywhere, is the divinely instituted means whereby he may most fully and perfectly fulfil his obligations. We shall see this, as we take them through separately, and consider in some detail how Holy Mass fulfils them all. 1. Honour and Glory of God. —It is the first essential duty of everyone of us to give glory to God ; it is also the first and highest end of sacrifice. God is jealous of His honour, as He declares by the mouth of His prophet : " I will not give my glory to another" (Isa. xlii. 8). And yet men rob God of His honour, by their neglect of His worship, and by their sins against Him. All the Saints and Angels of God's Creation together could never offer Him adequate glory, for they are but finite beings, hence all their efforts and endeavours are likewise finite and limited. The Cherubim and Seraphim, therefore, with their burning love and zeal, even Mary, the Queen of Heaven, with all her virtue and merit, could not, together, offer to God the homage of adoration and glory which are His due, for they are but creatures, and therefore finite. Now, Our Lord on the Cross, in offering Himself up in death, presented to the Father in Heaven the most perfect act of honour and glory, because He offered up Himself who was Son of God, equal to the Father in all things. Thus did God, for the first time in the history of Creation, have sacrifice offered to Him really worthy of His Divine Majesty. All the sacrifices of the Old Law were but as smoke and vanity before Him, as regards their intrinsic merit and value, and they only became pleasing in His sight, inasmuch as they had been ordained by Himself to be typical of the great Sacrifice of the future, the death of His Son on the Cross. We have already seen how the Sacrifice of the Mass is the same as that of Calvary ; thus, then, Holy Mass likewise offers to God honour and glory infinite in value and truly worthy of Him, the Victim being none other than His own Divine Son. In offering, then, the holy Sacrifice of the Altar, we are enabled to pay to God the primary duty we owe to Him, that of homage and adoration, and that, too, in a manner worthy of God, despite our own unworthiness and sin. Did we but realise that we have it in our power to present to the Lord God of our creation a worship of infinite value and actually worthy of His acceptance, how eager we should be to present it daily to His Divine Majesty! and with what sentiments of devotion we should accompany the offering! Such was the thought that animated the Saints and holy people of every age ; the same thought duly meditated on will fill us likewise with zeal and devotion. duty, though too often forgotten by men. But how can we, sinners as we are, dare to approach the throne of God to thank Him for His endless benefits ? And if we did dare, what have we to offer Him in return? Quid retribuam Domino? " What shall I render to the Lord for all He hath rendered unto me?" Such may well be the cry of the helpless soul. But the answer is soon forthcoming : " I will take the chalice of salvation and call upon the name of the Lord." In other words, the Sacrifice of the Eucharist, as its name implies, gives us the means of offering to God, not only infinite glory, but also adequate thanksgiving for His benefits. For do we not there offer Him again His Divine Son, infinitely pleasing to Him, and therefore a return equal to all the graces we have ever received ? The spirit of thanksgiving has always been a characteristic of the Saints, and they have grieved over the ingratitude of men, and have endeavoured to supply for this heartless indifference and neglect. Hence their love for Holy Mass, because by it they were able to make a worthy return for the Divine blessings bestowed on the world. Our Lord gave to S. Bridget the increase of thanksgiving as the reason for the Sacrifice of the Mass. "My body," He said, " is daily immolated on the Altar, that men may love Me so much the more, and more frequently call to mind My blessings." Let us also be fired with the desire of thanksgiving, and assist at daily Mass, if possible, so as to make a worthy return of heartfelt gratitude to God, for the favours we have already received, or may yet receive at any future time. 3. Petition for all Blessings. —When we reflect on the past, and recall the numberless favours we have received, we sometimes begin to wonder how we could ever have done without them, and what would have become of us, had it not been for God's generosity in our regard ! This experience of the past should lead us to think of the future ; we begin to understand how much we are dependent on God for all that we have or hope to have. In the temporal order, we need the Divine help in our daily lives, that success and prosperity may crown our endeavours and lead to happiness and peace ; things innumerable are necessary to us, and our wants are continuous. Then, if we turn to the higher order of things, the supernatural wants of our souls, the same holds good again, and we find how helpless we are of ourselves, and how many graces we need, if we are to please God and save our souls, in spite of all the obstacles we encounter in the spiritual life. Now, when we consider our sinfulness before God, and realise how unworthy we are to lay our petitions at His feet, we may well feel misgivings as to the prospect of our prayers being heard, or our requests being granted ; and yet we cannot do without these favours of whatever kind. Thus, despair might easily overwhelm us, unless we could turn elsewhere for help. Such help is to be found in the Holy Sacrifice. For, what can God Almighty refuse to us, when we offer Him His own Divine Son, and present our petitions through Him ! How can God fail to hear us, when He sees this Victim, in whom He is well pleased, offered up to Him, and making appeal in our behalf! In his Passion and Death, Our Lord merited for us all the graces we may require, and it is through the Holy Sacrifice of the Mass that this fountain of treasures is opened and brought within our reach. To it, therefore, should we go, whenever we are in need of help, for it is truly the sacrifice of impetration, the effectual means of obtaining from God every kind of blessing. S. Porphyrius once went to Constantinople to ask a favour of the emperor. On his way, he met the servants of the latter carrying his infant son in their arms. The Bishop immediately drew near, and placed his petition in the hands of the young prince. The emperor, agreeably surprised at this singular artifice of the prelate, readily granted what he asked, through love for the little bearer—Let us ask in a similar manner the favours we wish to receive from God. In Holy Mass, the adorable Victim on the Altar is ever ready to carry our prayers before the Throne in Heaven. Hence, let us go in all confidence to Him, and pray according to the wants of our hearts. Lingard tells us in his History how good King Ethelred, in the ninth century, seeing the Danes overrunning this country, marched out to meet them with an army, small as to numbers, but fired with a martial spirit. On the morning of the battle, he attended Holy Mass to prepare himself for the desperate combat in which he was about to engage. During the Mass, a message was sent to him, announcing the advance of the enemy, and saying it was necessary he should hurry to lead his troops to battle. But Ethelred continued hearing Mass with the same fervour and recollection as before, saying he would not leave the church until he had united himself to the Conqueror of conquerors, and had obtained His blessing. When he had communicated and Mass was ended, he arose full of burning ardour, placed himself at the head of his army, and in a few hours gained a brilliant victory over the Danes. Behold an example worthy of our imitation ; we may appeal to Our Saviour in Holy Mass. Let the weak and the tempted go to Mass, and they will gain the courage and strength of heavenly grace ; let sinners go to Mass, and they will feel their hearts moved with grace to repent and amend ; let the poor and the heartbroken go and lay their wants of every kind before their compassionate Saviour, and He will not send them away empty-handed. The young and innocent, the old and weary will alike find there the joy and comfort and consolation they seek for. Not till the great judgment day shall we know what blessings and graces we owe to the most Holy Sacrifice! It is a perennial fountain, ever flowing with the waters of grace and mercy. " You shall draw waters with joy out of the Saviour's fountains" (Isa. xii. 3). 4. Pardon for Sin. —As sinners who have offended God, we owe to Him a further duty still, the duty of seeking pardon for our offences against Him, and of making reparation for them ; for, if we fail in this, we cannot please God, or come to the possession of Him in Heaven. Could any mortal being reckon up the sins of the world at this present moment, without referring at all to those of ages gone by! And, apart from the sins of others, can anyone count up his own ? Yet for these we must ask pardon and do penance. day (Exod. xxxii. 28). Then, for one single mortal sin, if we die unrepentant, Heaven is lost forever, and Hell will be our unending punishment! Yet God is all love for His creatures, and all justice in dealing with them ; He cannot punish sin one iota more than justice requires. Yet, see how He has punished it, and even yet punishes it in eternity. How great, then, is the evil of sin before Him, and how intense the hatred He bears to it! Of ourselves we could never atone for it. Not all the Saints in Heaven together could do so, for we are all of us but finite beings. In love for His fallen creatures, Our Blessed Saviour came and suffered, and sacrificed Himself, a victim of infinite merit, to repair the evil that sin had offered to the offended majesty of the Father. The Sacrifice of the Cross is renewed in the Sacrifice of the Mass, and its infinite merits applied to our souls; hence it is that Holy Mass has power to appease God for our sins, obtain for us the spirit of true repentance, and lessen also the temporal punishment due to sin, according to the measure of our dispositions. Therefore let no one stay away from Mass on account of his sins, as people sometimes are inclined to do. Though a man be plunged in the depth of sin, let him, on that very account, hasten to Mass, humbly acknowledging his guilt before God, and expressing sorrow for what he has done. His heart will then be moved to true repentance, and though the Holy Sacrifice will not forgive his sins, it will at least dispose him for their forgiveness in the Sacrament of Penance. This Sacrifice of propitiation is offered up daily, hourly, all over the earth. What would become of the world without it ? St Leonard of Port Maurice used to say, that, were it not for Holy Mass everywhere offered up to Heaven, God would destroy the world for its sins. To its efficacy, undoubtedly, we must attribute the lesser frequency in our day of those terrible chastisements with which God so often punished mankind in the olden time. The pages of the Old Testament give countless instances of such punishments, those already given being but a few examples. Sin is no less hateful to God now than it was then ; on the contrary, it must be even more so, on account of the more abundant graces now bestowed on the world. Hence we may well understand how true are the words of holy men that, but for the Sacrifice of the Mass, we should long ago have been treated as were the wicked cities of the plain. Why, then, do men so seldom go to Mass ? Why do they hear it so distractedly ? Why not seek now, by its means, to repair the insult offered to God and the injury done to their own souls by sin ? What more effectual satisfaction can we ever offer to Heaven than this Sacrifice of the beloved Son of God ? Oh! try and bring home to yourselves the full import of all that the Saints have felt and said of the power of this Holy Sacrifice to repair the evil of sin. Then you will try to be present at Mass more frequently and more worthily, so as to appease God for the sins you have committed, and shorten the punishment they have brought upon you. Sing often with the prophet of the Lord those words of gratitude and sorrow : " Bless the Lord, O my soul, and never forget all He hath done for thee : who forgiveth all thy iniquities, who healeth all thy diseases, who redeemeth thy life from destruction, who crowneth thee with mercy and compassion" (Ps. cii. 2-4). Such are the mercies granted to us through this Sacrifice of propitiation. The four great ends, then, of the Sacrifice of the Mass are : Adoration and Thanksgiving, Petition and Reparation. These are the four chief duties every man owes to God, and he is able perfectly to fulfil them by means of the Mass, of all forms of worship the most sublime before God, on account of the dignity of the Victim, the Son of God Himself, on account of the sanctity of the Priest who offers it, Jesus Christ again, on account of the wonderful effects it produces—giving glory to the ever Blessed Trinity and the heavenly Court, bringing relief to the Souls in Purgatory, and obtaining manifold blessings for mankind upon earth !